Hello everyone! Welcome to the third challenge over at Digi Haven! I am super excited that summer is here! Not so crazy about the heat waves here in the DC area! The past couple of days have been really, really, really hot! Really! The theme this week is to make a card with a summer theme. Remember your image must be a free digi stamp. If you need some help looking for free digi stamps visit the Digi Haven blog for a listing. For my card, I used a digi stamp from Broken Box Stock. It's a cute Chelsea and Mario Sandcastle image. I used my copic markers to color in the image. I used some old K&Company paper that I got last year. It made the perfect back drop for my image. 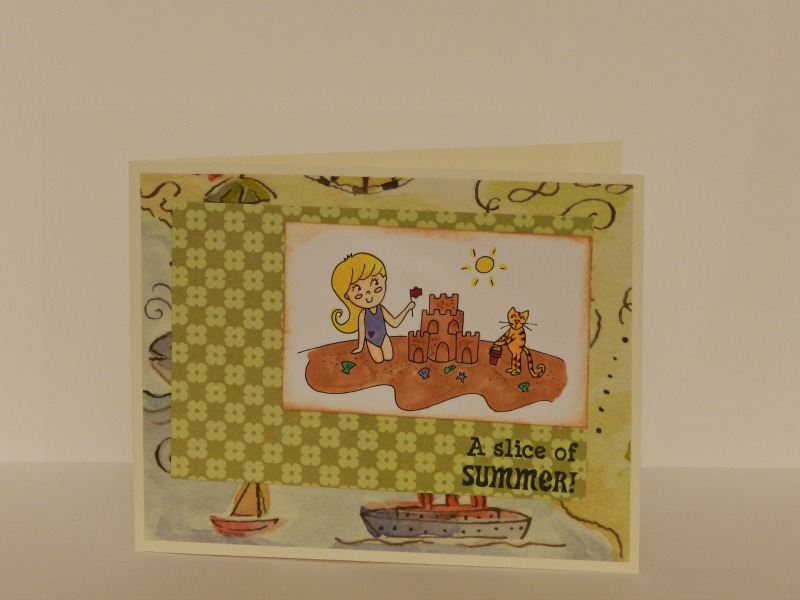 The sentiment is from Cardz TV Stamps "Fun in the Sun" set. I love this set. I have really been working with it a lot. You pick up this set for your summer themed projects. Make sure you stop by the Digi Haven Challenge blog and see the amazing projects my fellow DT members came up with. They really used some great free digi stamps. Thanks for stopping by! Great job Candice! I love this free digi image. You've done a lot of fantastic coloring on it. The textures and background papers are wonderful. Thank you so much for being on the Digi Haven DT. We love seeing all the wonderful projects you create!! ♥ Denise @ Digi Haven. Candice this is such a great card. A fun digi and such cute DP.